After such a long and arduous summer, most folks welcome winter’s chill. Unfortunately, with the cold come shorter days and longer, darker nights, triggering what is commonly known as “seasonal depression” in many people. If someone just can’t let summer go, they need only remember that winter, at least in the South, is for the birds. Song birds don’t just spread joy In the Spring- by figuring out the bird’s native to their area, what those birds eat and their preferred habitat, an individual can have a yard full of wonderful creatures to watch during the cold season. A variety of lovely species of birds make their home in Arkansas. The White-Breasted Nuthatch, a small gray bird sporting a white belly and black head stripe, or ‘cap’, can be seen working it’s magic as it walks down tree trunks head first. The cheery American Goldfinch is a bird that changes with the seasons. While they are best known for their summer coloring of bright yellow with black caps, wings and tails, they become an olive-brown in the wintertime. Though their plumages change, their beautiful songs are carefree and abundant no matter the time of year. Goldfinches love to come out to the birdfeeders in droves, especially in the winter. Then there’s the lively Tufted Titmouse, who’s funny name doesn’t quite exhibit how enjoyable these birds are to have around. The Titmouse enjoys hanging upside down from branches in search of tasty treats like spider eggs. The House Finch is another bird common to the state. In 1940, federal agents raided a home in Long Island, New York that housed a cage full of House Finches being sold as pets. The birds, natives of the Southwest, were released, and as a result, can now be seen year round all over the country. All of these birds enjoy Nyjer or Thistle seed as well Black Oil Sunflower seeds and Sunflower Hearts. Studies have shown that more species of birds will choose Black Oil Sunflower seeds over any other food that is offered, making them a safe bet if just starting out feeding the birds. While many people try to be thrifty by buying cheap, prepackaged feed mixes, the really savvy shopper goes to specialty stores looking for bird seed in bulk. Low-priced mixes often contain rice, rye and oats that birds won’t touch, wasting money and leaving behind a mess. In the end, the higher price equals good quality and a guarantee that the birds will show up. Specialty stores also have employees with a working knowledge of how to attract the species a customer wants to see in their backyard, which is the prime habitat of Arkansas’ native birds mentioned before. Aside from having the right food, a reliable feeder is essential. Hopper feeders that are loaded from the top and usually have many perches are the best for preserving the bird food and can be simply hung from a tree branch. They also don’t need to be filled as often as other feeders. Platform feeders set on poles or pedestals and sock and tube feeders are good options as well. In the end, having birds around is not just essential for entertainment while beating the winter blues. 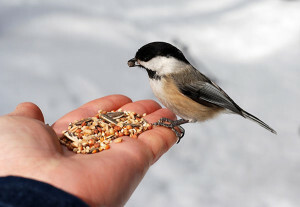 By taking care of the birds in the winter months, a person reaps the benefits of the bird’s appetite for insects in the spring and summer. Therefore, everyone can enjoy the songs and sight of these delightful creatures while cutting back on pests. Here at Conway Gardens & Pools we offer Nyjer Black Thistle seed, Black Oil Sunflower seed, and a Wild Bird Seed mix in smaller amounts at bulk prices. We also have an array of feeders available as well as charts detailing what different species enjoy. Come see us for a bird-filled season!